David Stark Design and Production had a surprising solution to transforming the cavernous Park Avenue Armory for the Jewish Museum’s Purim Ball – T-shirts. The design and production team envisioned thousands of t-shirts in spectacular hues as the main design element for the museum’s annual gala in February. To achieve their vision and meet local fire codes, David Stark commissioned Turning Star for the flame retardant treatment of the shirts. Over 5000 shirts were individually processed using Flamexx™ CLS6 with 0% VOCs at Turning Star’s facility in order to meet strict NYC fire codes. 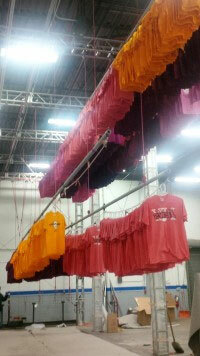 The resulting colorful canopy was a brilliant design component for thousand guests in attendance. Click here for additional photos from the event. Turning Star was pleased to help transform an innovative idea into a beautiful reality for the public with our flame retardant products and services. For assistance with your unique décor solution treatments, contact Turning Star today!